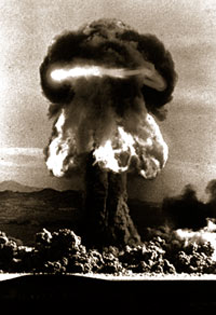 The mushroom cloud from the Grable test of 1953 (15 kiloton). In making the case for attacking Iraq, President Bush and various members of his administration made use of a metaphor developed by his chief speechwriter Michael Gerson: "the smoking gun that could come in the form of a mushroom cloud." Using this metaphor, the administration introduced powerfully vivid imagery that persuaded many Americans of the correctness of its views with regard to Iraq. Yet, since the image was not part of any logical or verifiable argument, it is a clear example of the use of misleading vividness. Photo courtesy U.S. House of Representatives. Rhetorical fallacies are often defined as errors in reasoning. Most of them actually are errors of reasoning. Members of that class are easily recognized once we understand them. But rhetorical fallacies that exploit flaws in the human ability to reason often escape detection even after we know how they work. The fallacy known as Misleading Vividness is one of these. Here's an example: "I wouldn't take a customer to lunch there if I were you. Remember when Grant was hospitalized? I heard that he got sick from the sour cream on their baked potatoes." Admittedly this "argument" contains errors of reasoning, but its power comes from its vividness: we know that restaurant, we know Grant, we've been to hospitals, and we know the taste of baked potatoes and sour cream. Grant's co-workers can easily imagine the scene. We humans evaluate the soundness of arguments, in part, in terms of the ease of imagining their elements. If the elements are especially vivid, we're more likely to process the argument heuristically, rather than systematically or analytically. When we do, logical errors are more likely. When we think, we usually use both heuristics and logic, with each process influencing the other. Those who employ the misleading vividness rhetorical fallacy are often trying to tilt us toward heuristics, away from reason. When they succeed, we're more likely to accept unproven conclusions. This phenomenon explains, in part, why advertisers use celebrity endorsers. They're trying to trigger heuristic thinking by relying on the good feelings we have for the celebrities. It also explains why politicians so often employ scare tactics. They conjure vivid, scary images that cause some of us to think more heuristically. When we make decisions at work, we have to be more careful. Here are three indicators of the use of misleading vividness in workplace debate. Messages that invoke more senses are experienced as being more vivid. The more direct the invocation, the more vivid the message. The story about the baked potato would have greater impact when told while baked potatoes were being served. their elementsmight be necessary as part of a discussion about, say, a dinner menu while planning a conference. Sensory breadth that isn't required as part of the task at hand could indicate the use of misleading vividness. Although counterexamples can disprove general claims, examples rarely prove claims. They're useful illustrations — nothing more. When examples offered as illustration contain powerful imagery that can invoke strong emotions, they could be instances of misleading vividness. Clarifying stories can be helpful. When stories are personal, first person or not, they can evoke strong feelings. Personal stories that evoke emotions are especially vivid. When listeners relive the experience of the story, or similar experiences, misleading vividness is a strong possibility. Would you like to see your comments posted here? rbreniUhEXssSXMVaYICEner@ChacVwVTCTfRkqVQwkgzoCanyon.comSend me your comments by email, or by Web form. I offer email and telephone coaching at both corporate and individual rates. Contact Rick for details at rbreniWXWDIFrYbZqOFaKner@ChacKikxbcsAZqFVVZLloCanyon.com or (650) 787-6475, or toll-free in the continental US at (866) 378-5470.